Robby Benson wears optical white high top Converse “Chuck Taylor” All Stars in the film. Henry has to go One on One with the basketball establishment at Western University. 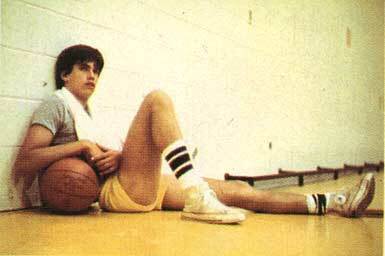 Henry Steele (Robby Benson) plays a star high school basketball player from a small town in Colorado, who is recruited to play on the basketball team for Western University in Los Angeles. At first, Henry is overwhelmed by what he sees and experiences on campus. He is quickly exposed to the corruption of big time college basketball, getting a new car for signing with Western, receiving envelopes of cash from well-heeled alumni in exchange for a pair of tickets to each ball game, or being given a “job” watching the automatic sprinklers turn on and off. He has trouble relating to the fraternity oriented party and drug scene that most of his fellow team mates are into and is surprised to find out that academic requirements are also winked at. Henry is assigned a tutor, a pretty graduate student named Janet Hays (Annette O’Toole), who at first thinks he is just another dumb jock, but is truly amazed when Henry actually wants to read and learn about his course work. Meanwhile, things are not going well at practice. Henry’s unorthodox methods of play don’t sit well with his coach (J.D. Spradlin) who expects all of his players to contribute significantly to the team, while conforming to his militaristic (don’t ever question, just obey) style of coaching. He quickly decides that Henry is not going to fit in, and begins badgering him to resign from his scholarship. But Henry refuses to give up and finds an unlikely ally in Janet, who helps him succeed in his academic classes and gives him the support he needs to battle the coach. Henry Steele contemplates the future of his basketball career. One on One is a film about both the growing up and loss of innocence of a naive young man as he faces the brutal “win at all costs” mentality of big time college sports, and his struggle to find out what is truly important in his life. The film is well-acted and has a fine musical score, with songs performed by Seals and Croft. The film does a good job of capturing a segment of college life in the seventies, the hypocrisy of so-called “amateur” sports programs as practiced at some schools, and the determination of an individual to succeed, even when the odds are stacked against him. Members of the Western University basketball team want to be NCAA All Stars. One on One doesn’t have a lot of scenes with Converse All Stars. You primarily see the team wearing adidas, which is the official shoe of the team, but there are a few scenes involving team practices where Robby Benson and some of the other team members wear black or white chucks high tops. 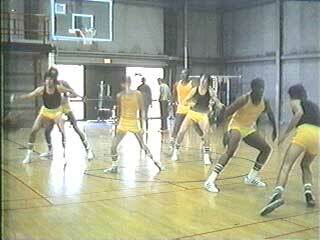 The best one of these scenes is a scrimmage between squad members in black and yellow jerseys. One on One. (1977) Robby Benson, Annette O’Toole, G. D. Spradin. Directed by Lamont Johnson. Categories: Drama, Coming of Age.